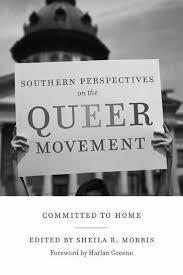 Join us from noon to 1:00 p.m. on Thursday, January 17, for this month's author talk and book signing: Southern Perspectives on the Queer Movement: Committed to Home by Sheila Morris. These collected essays by South Carolinians explore their gay identities and activism from the emergence of the HIV-AIDS pandemic to the realization of marriage equality in the state thirty years later. Each of the volume’s nineteen essays addresses an aspect of gay life, from hesitant coming-out stories in earlier decades to the creation of grassroots organizations.